Piana whist famous for the most incredible coastal scenery stands 438m above the nearby sea. From the centre of the village there is a road to the Plage d'Arone, the D824 which soon branches off to the right and down to Anse de Ficaghiola. As you descend just under five kilometres you're likely to give some thought as to how you're going to get yourself backup. Don't worry you have a choice - cycle or walk! This road is steep and narrow and I urge great caution in the high season. It's best done early or late in the day. The descent and ascent stops/starts in the car park at the end of the road. The first half of the return journey is the hardest with 2 km of 10% plus including two short sections close to 20%. The second half gives some respite but none that I suspect you'll notice. Now I must confess that I've only done this route on four wheels but it is in the 2013 plan! 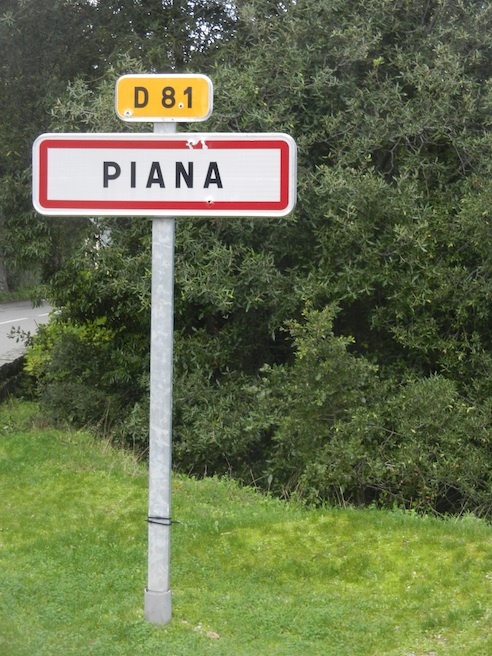 An alternative is to continue on the D824 to the Plage d'Arone. Apart from being a beautiful spot this beach is famous because it was a dropping off point during the second world war for supplies for the Corsican resistance by the submarine, La Casabianca. This must have helped because in 1943 Corsica was the first part of France to be freed of the occupation. A 24.5 km round trip from Piana with a maximum gradient of 10%, and average of 5% on the way back.